Gamadecor is present at the 24th International Global Architecture and Interior Design Exhibition put on by the PORCELANOSA Grupo, whose aim is to expand its solutions for bathroom design. That is the reason why in this edition of the event it is launching five new bathroom furniture series, all aimed at contemporary spaces. Quality, practicality and adaptability are the main features in these new collections, which have been created by banking on the best materials for excellent equipment. Duna bathroom furniture by Gamadecor shows us how the bathroom of the future will be designed, through its unique shape and pioneering spirit. It amazes because of its elegant combination of materials which conveys authenticity in a contemporary style. Specifically, Duna furniture consists of a channel-shaped aluminium sheet where a natural granite basin manufactured with “Folding” technology is installed, and it is fitted in the inside gap of the curved sheet so that the material vein is provided with continuity. Regarding the finishes, it is available in a superficial black lacquered epoxy paint and Portobello granite. In the Duna collection, it is also worth highlighting its wall-hung auxiliary unit with a drawer in natural oak with a rustic look. The furniture comes with a circular aluminium shaped mirror which includes a practical shelf situated on the inside of the ring and the built-in lighting. 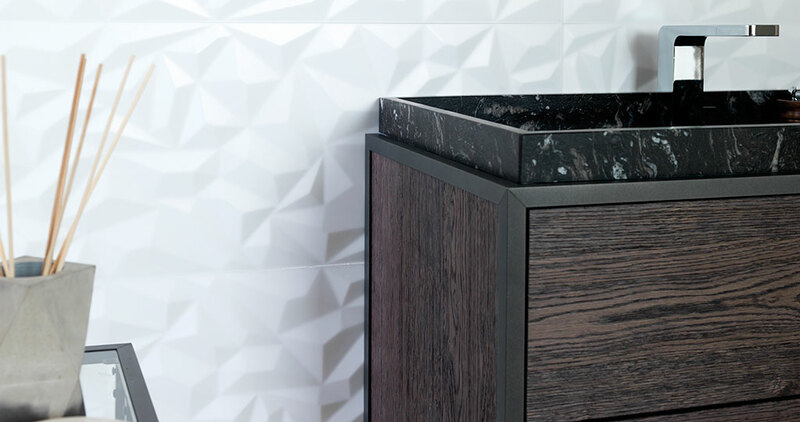 Bevel, for its part, makes use of the KRION® Solid Surface mineral compact to express geometry and minimalist style. Its most outstanding feature is the original frontal plane leaning inwards which does not reduce its storage capacity. 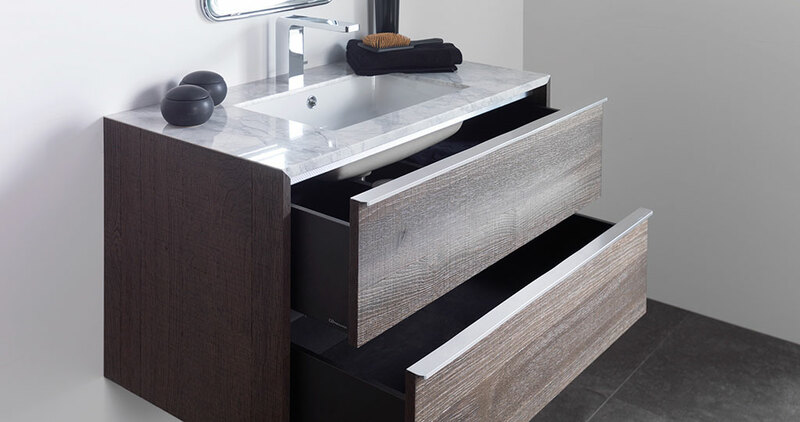 KRION® provides this design with its resistance through having less thickness, jointless connections and it allows for the relocation of the drawer rails as well, which being moved from the lower part to the top part of the drawer, makes its removal easier and works as a kind of basket. Continuing with such an elegant ‘minimal’ aesthetics, the Bevel drawer handle consists of a horizontal slot done in the front. 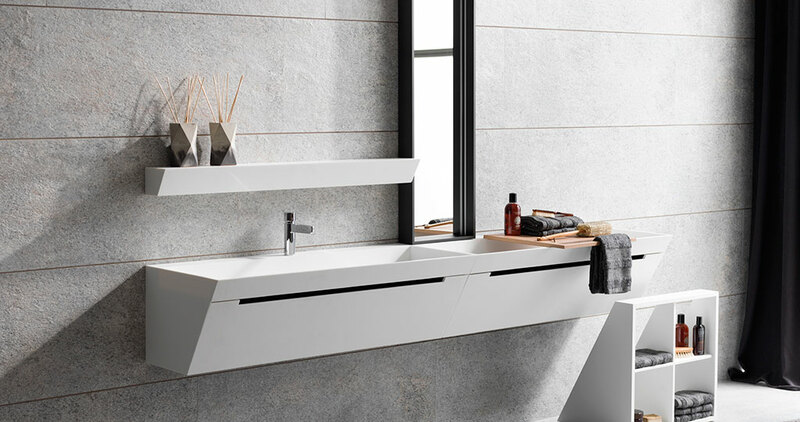 Regarding the series, it is complemented with two mirror options and a mobile auxiliary unit working as an open shelf with wheels integrated into the bathroom, making it more functional. 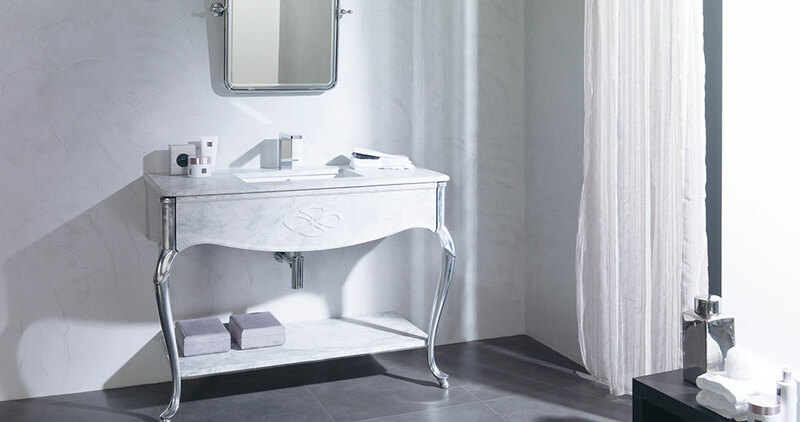 This more classical-styled collection consists of a composition whose main element is a basin unit with two different parts: legs made of aluminium casting working as a support for the shelf in natural stone in the top part and a mounted natural stone washbasin stand with a solid block appearance in the bottom part. The decorative detail engraved on the front surface of the stand really catches the eye and it reinforces its vintage character. Regarding the Yester furniture, it has a drawer with a finish done inside in Sable laminate and Nadir texture. 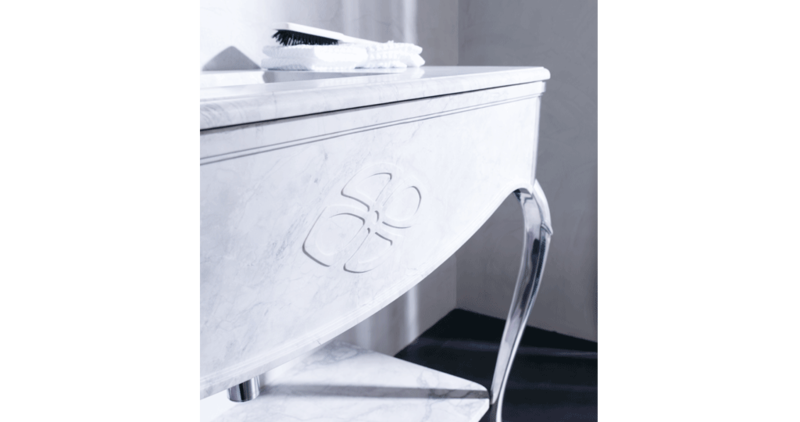 The vanity top, for its part, is made of natural stone and can include an under-countertop basin in Sotto Box ceramic or stone. The essential complement of this bathroom series is a stunning mirror, whose frame is in a gloss chrome finish. The combination of retro style stone and wood is the main feature regarding the new Century bathroom furniture by Gamadecor. It is a piece made of carved natural oak veneer which provides a rustic touch. A piece of compact furniture with two drawers, whose inner finish is in Sable laminate with Nadir texture. 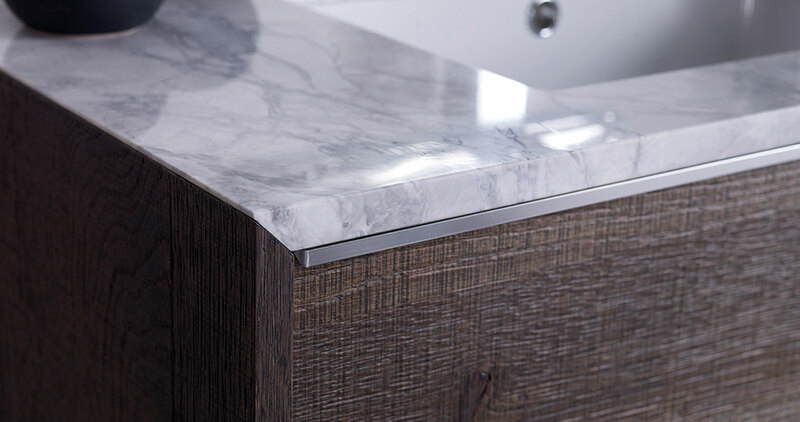 At first sight, the furniture stands out because of two facets: it has slightly sunken fronts with a metal handle; and its side panels and the wood veneer base are joined by mitre joints between them both and the vanity top, therefore creating a block that is continuous and unique. 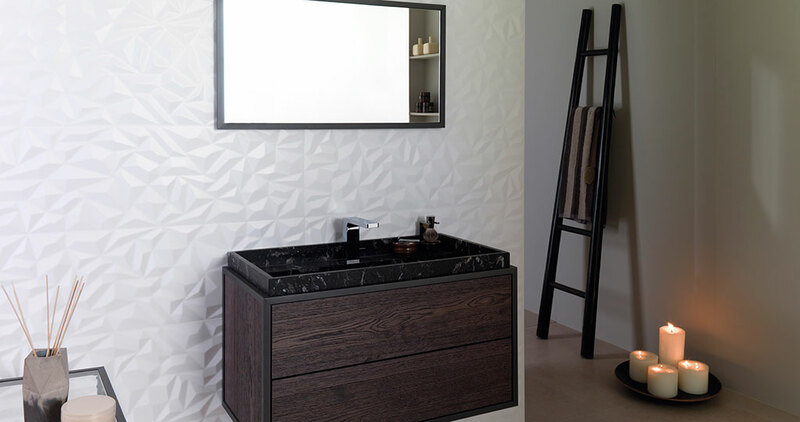 Regarding the vanity top, it is made of natural stone and can include a stone or ceramic under-countertop basin, as with the Yester collection. The mirror which comes with Century is in a gloss chrome finish. Edge is both the most elegant and rustic design in all the latest designs by Gamadecor. 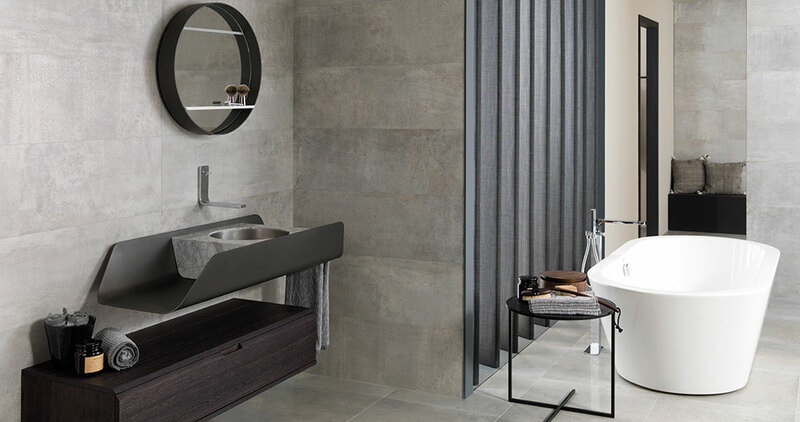 An element with an exterior structure and a Sable finish aluminium profile enveloping the natural stone basin and the carved wooden furniture. This combination with vintage connotations has three furniture options with two drawers, with a top drawer and bottom shelf, and with a shelf on the bottom. Additionally, it includes four different width measurements: 60, 90, 120 or 150cm, with the choice of a 2-bowl basin for the widest measurement. In a complementary way, and in the series, one can find several mirror designs with the frame in the same aluminium profile that the furniture is characterised by. If you are interested in seeing this design and other bathroom designs, do not hesitate to visit the 24th PORCELANOSA Grupo Exhibition from February 13th to 17th.